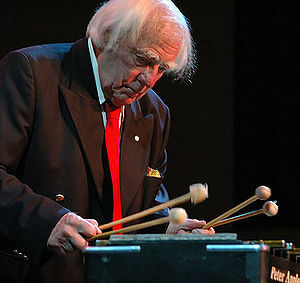 British born, but Canadian jazz composer and percussionist Peter Appleyard passed away on July 18, 2013.He was 84. Born in England, he moved to Bermuda in 1949 , eventually landing in Toronto a few years later. In the 1950’s and 60’s , he was a staple on CBC radio, performing live on various shows. In the 1970’s he began touring and playing with the Benny Goodman sextet. As time went on, his reputation grew as a world class vibraphonist. He played with such greats as Ella Fitzgerald and Frank Sinatra, while always maintaining his base in Toronto. Among his many awards were a Juno and the Order of Canada. Terrific player. I have posted here a couple of tunes, the first a recent live performance of “It don’t Mean A Thing” and an older clip of “Tangerine”. Both of them have many great artists along with him. This entry was posted in Canadian Music, Jazz, Live Music, Music, Music History, Remembering, Song Of The Day and tagged Canada, Canadian Music, Music, Peter Appleyard, Remembering. Bookmark the permalink. Very interesting. He was a fixture in Toronto’s music scene. Did you ever see him? Yes, on a tv show he had. I believe I was turned on to it by a friend who was a jazz musician and played with Peter. Great talent. Listened to him a lot, sometimes without knowing it. I had the pleasure of seeing him at a jazz festival. He was brilliant. Lucky. Never saw him live. Great player. Sorry to hear we have lost another great musician!